My feet feel the cushion of grass, thick, green and shaded by a tall stand of gum trees. 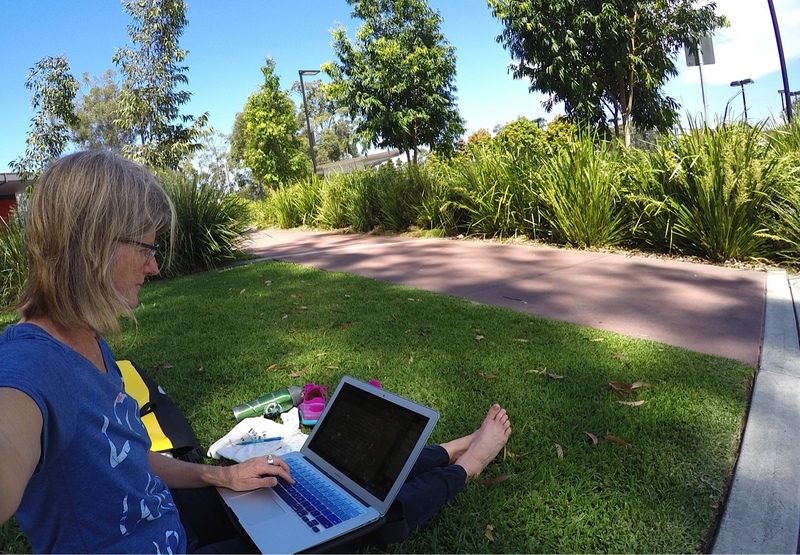 It’s lunchtime at Griffith University’s Gold Coast campus, my surrogate workplace for National Ride2Work day, and I’ve made a temporary office on a quiet piece of lawn. A northerly breeze simpers through native leaves, casting a shimmering mosaic, promising a tailwind for the ride home. Because I work from home, I’ve decided to shadow a bicycle commuter for National Ride2Work Day. Neither of us have ridden to this destination before. The bicycle commuter usually cycles to a tram stop, locks her bike and catches the tram to the university. Cycling all the way to the campus is double the distance. Our commute started later than planned – 5.45am rather than 5.30am. I’d built in some extra travel time, as I always do, to cater for the unexpected so there was no need to worry. The sun was hidden behind a motley array of clouds, toning its heat to a comfortable warmth but mellowing the buoyant breath of a brand new day. Clear blue skies, sunshine and birdsong always speak in volumes that can’t be ignored. Cloudy days are quieter, moodier perhaps, less evocative to the senses. I was grateful though for the absence of both the rain that fell overnight and the northerly wind that blew for the past two days. A northerly would’ve meant a headwind for most of our 27 kilometres. The first 17 kilometres was familiar terrain – across Tallebudgera Creek, over Burleigh Headland, along Nobby’s Beach esplanade, up to Broadbeach and onto Surfers Paradise with its high-rise towers hugging the beach. On the esplanade at Surfers Paradise, we stopped at the bike commuter breakfast organised by the Gold Coast City Council and Bicycle Queensland. Not to eat, just to say g’day. We had a picnic breakfast packed. I’d made Bircher muesli the night before, mixed it with grated apple and fresh blueberries in the morning, and packed it alongside an ice brick. We ate beneath a pandanus tree on the Surfers Paradise beachfront and enjoyed the view. Then came the kilometres less travelled. On the coastal strip, Surfers Paradise turns into Main Beach and, here, something unexpected happened. We decide to ride on the road for speed – it’s already 7am, the lecturer has to be in class at 8am and we still have ten kilometres to ride. But soon concrete barricades appear, wire fencing, grandstands wearing empty plastic seats and advertising banners for oil, fuel and tyres. 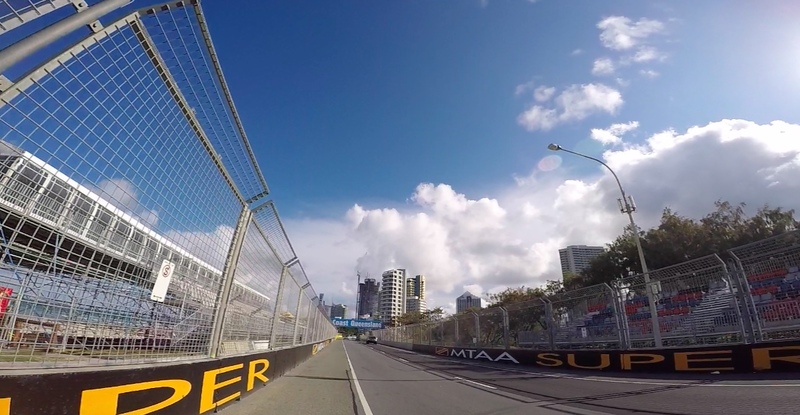 We’re riding on the V8 Supercars racetrack! For a few days in late October the ‘Gold Coast 600’ fills these streets with speeding cars, burning fuel and testosterone. During our bicycle commute, we had the track to ourselves – local car commuters know to avoid this area while the track is being set up each year because there are always traffic delays. Our only delay was trying to work out how to ‘escape’ this tunnel of wire fences and concrete barricades that we’d stumbled into. Did my pace pick up at the thought of being on the soon-to-be racetrack? Perhaps a little. After a momentary panic about being stuck on this racetrack and the passing of about 600 metres, a gap appeared in the wire fencing and we wheeled over some grass, past the temporary port-a-loos, over a footbridge and into Macintosh Park where ducks and geese fed, and elaborate peacocks made theatrical displays of richly coloured feathers. Then more new territory appears. And it comes in the form of a light rail system; the Gold Coast’s ‘G:link’ tram which opened in July 2014. There are underpasses for crossing the road and overpasses for traversing the river. New to navigate but easy to pedal. The cycle ways are smooth and the signage clear. Then came the hill we hoped to avoid. We saw it from the top of a crest that dipped down into a gully before rising for a long slow climb. ‘What was that other way you were talking about?’ giving away my apprehension. Then I reminded myself that hill climbs have a way of looking more daunting than they are. ‘We’ll be halfway up it before we know it.’ And we were. Over the crest, down towards an intersection and then onto a trail through bushland, glistening with moisture from the evening rain and refreshing our cells. Birdsong gave way to sounds of cars speeding along the Smith Street Motorway and the light rail sliding on its tram tracks. We were almost there. One more hill and then the best part of this commute arrived in the form of some superb infrastructure: A bicycle lane, an entry way cut into the kerb for a quick exit from the road and we’re delivered to the Griffith Health Centre where a sign reads ‘End of Trip Facility’. In this instance, ‘end of trip’ specifically refers to the end of a bicycle commute. Accessed only by staff or student card, the facility provides bike racks and two large change rooms with showers. This type of facility adds to the ease of bicycle commuting and is evidence of an organisation’s genuine commitment to encouraging active travel. I was impressed. The lecturer arrived in class on time. I went to the coffee shop for inspiration for writing and, after lunch, set up my temporary office here on the lawn. POSTSCRIPT: The trip home was less eventful and slower. We were both tired, plus the northerly didn’t follow through on its promise of a tailwind. A round trip of 54kms is a long commute pedalling a bicycle. But in the spirit of this experiment and of National Ride2Work day, this commute was about having a go, trying something new and seeing how it fits. It’s unlikely to be sustainable as an ‘every day’ commute. Weaving it in once a week or once a fortnight is possible. The cycle/tram combo is a more realistic option. In convoy… travelling by bicycle on National Ride2Work Day. 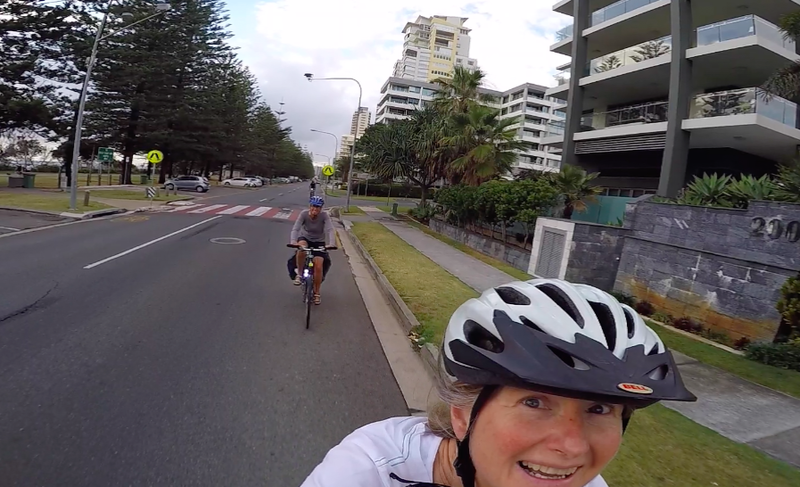 Dedicated bicycle lane makes commuting easy between Miami and Broadbeach. Arriving at Surfers Paradise esplanade. 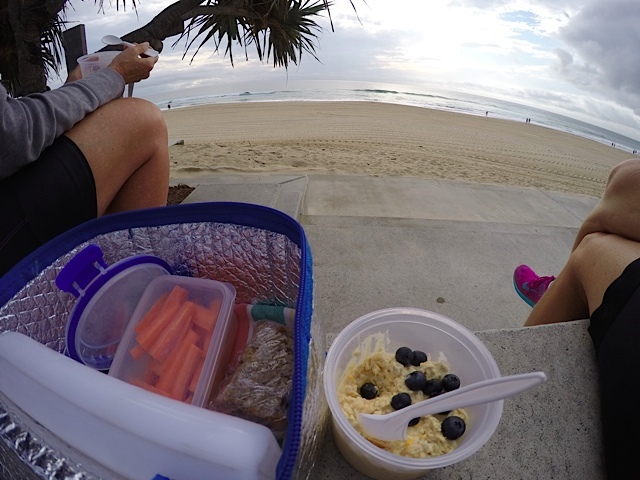 Picnic breakfast by bicycle… with an ocean view. Trapped on the V8 Supercar Racetrack! One of the elaborate peacocks with richly coloured feathers. 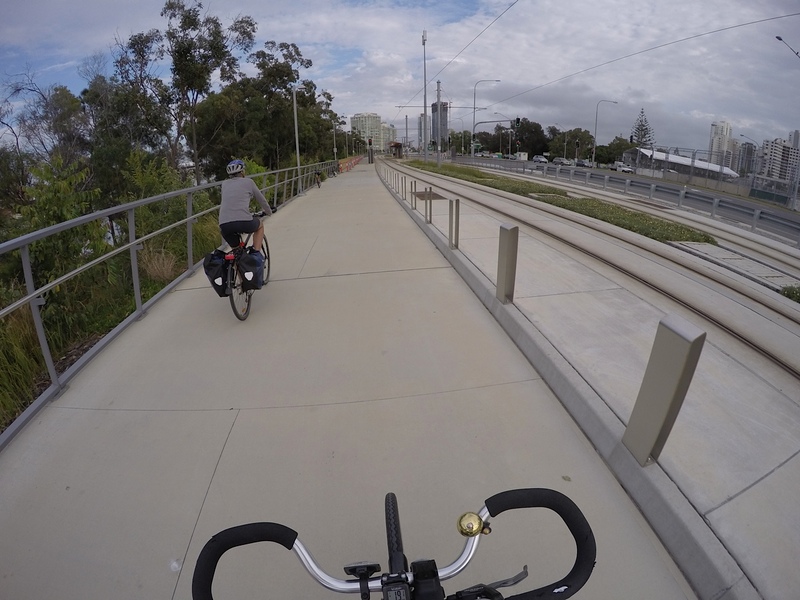 G:link Tram tracks run beside smooth cycleways. 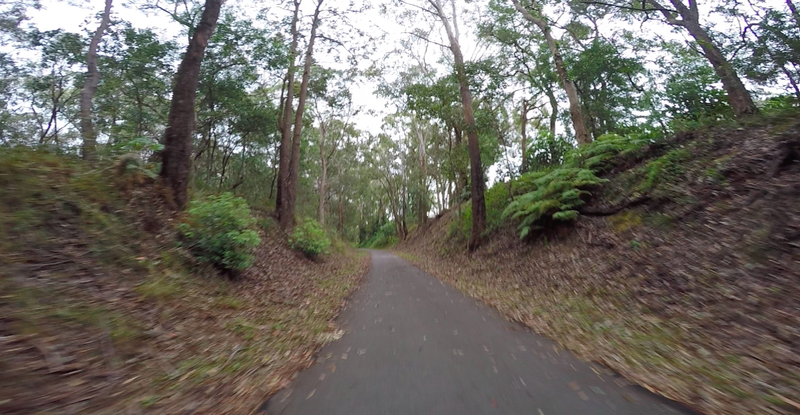 Bushland trail near Griffith University Gold Coast campus. 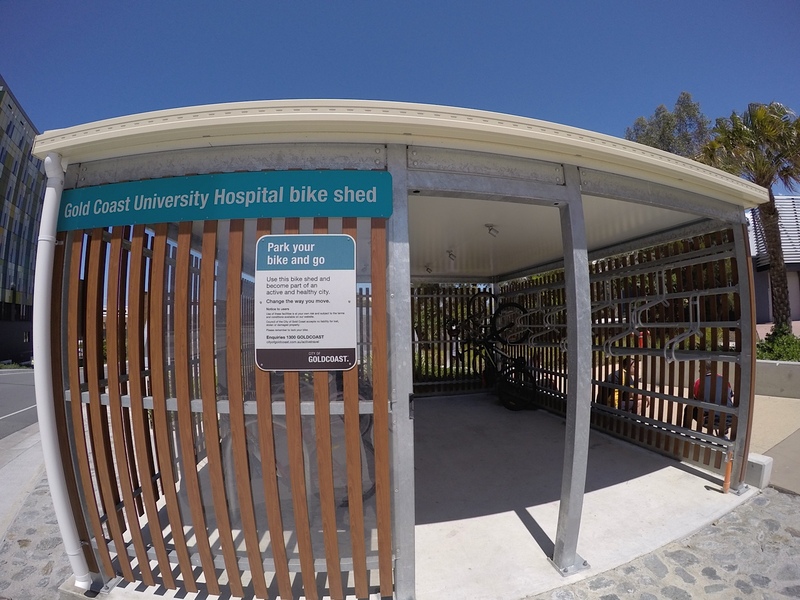 For visitors to the University/Hospital precinct, this Gold Coast City Council bike shed provides undercover bicycle racks. My temporary office on a quiet piece of lawn. Was sharing road space with cars an issue for either of you? I’ll confess it’s off-putting for me. I can understand that Michelle. I think it’s a common concern. And thanks for asking. For our morning commute, there weren’t many cars at that early hour so it was quite fine. The afternoon was a different story with more cars and buses to negotiate with. In those busier areas though, we mostly had a bike lane in which to ride. I always feel more comfortable when there’s a bicycle lane marked on the road. Somehow it asserts the right of the bicycle to be there and that instils confidence, which I think is an ingredient for riding well – confidence to be assertive (not aggressive – that just doesn’t win any friends) plus staying alert to anticipate things ahead of them happening (like doors opening). The other ingredient is good signalling. I’m a chronic over-signaller and happily so. Last year the Queensland government introduced a law that vehicles must allow at least one metre between their vehicle and bicycle riders. They coupled it with a widespread advertising campaign and since its introduction, I’ve found motorists and bus drivers much more considerate when passing. Fortunately our commute also involved some lovely off-road paths shared with pedestrians. It can be a little slower than a bike only lane but I don’t mind that. I’m hopeful that in years ahead, better infrastructure will reduce, even further, the need for bikes to mix with cars. I’m impressed, and what a wonderful looking commute by the water. And that breakfast! You can join me for a morning ride anytime 🙂 Best of all, I like the look of your office. We have a BikeToWork week coming up in a few weeks. It is intended to encourage cyclists to ride to work even during the wet, cold, winter months. I have been a dedicated commuter for several years now, and look upon the rainy season as a challenge. No, adventure. Once I worked out the clothing thing, I learned to really enjoy it. Like you I can cycle beside the sea much of the time. It is life changing. It sounds like riding to work is part of everyday life for you Gary and that any of the discomforts or difficulties are far outweighed by the benefits that flow to you. That’s the great thing about these Bike to Work initiatives. They give people an opportunity to experience a bike commute, with support from more experienced bike commuters, and hopefully feel how good it is. Gail, I’ll be interested to learn how cycling more has changed your life. Better fitness, money saved and I think there’s greater resilience in there too. That’s a snapshot that needs more reflection. It’ll soon be one year since I started the experiment, so I’m planning a post to mark that milestone and reflect more on how life has change over the year of cycling. I’m interested in the changes you’ve experienced too Gary… have you written a post on that? No I haven’t Gail. Not yet at least. It’s an interesting idea. I have certainly changed for the better. Fitter. Less rushed. More patient. My legs are shaved now and I prefer cycle clothing to most anything else. That’s a great collection of changes for the better. Slowing down is something I’d add to my list too. Thanks Gary. You’re a legend, Gail. What a challenge! I second that – a great achievement! The pit stop on the beach was more my style. Breakfast sounded yummy. Thanks Jane. It was certainly more exhilarating than being inside a car in traffic. I felt quite exhilarated by the exercise and after some re-fuelling, ready to work… albeit in my temporary office on the lawn 😉 The end-of-trip facility was a nice surprise on arrival. Not only the fact of the secure facility and the showers but also because of the seamless exit from the bike lane onto the footpath and landing at the facility’s doorstep. It is well-designed. Hi Gail. Well done for giving the ride to work a go. I am especially impressed by your dedication to the experiment with a planned 5.30am start. Hi Margaret, it was fun giving it a go. At this time of year, it’s daylight at 4.30am in Queensland (no daylight saving) and so it’s quite easy to be awake and into the day very early. It would be a different story if it was winter! Wonderful vicarious experience. And your temporary office decor is impeccable. Effect achieved! With minimal effort, I would venture a guess?